How well do you know “the Neck”? Perhaps you know a bit, and you’re open to learning more about its history and its present challenges. Or perhaps you’re confused by this strange anatomical reference and have no clue what I’m talking about. In today’s program, I’ll try to sweep aside the mystery by focusing on the origin and the evolving definition of Charleston Neck, that curious stretch of no man’s land bounded by the rivers Ashley and Cooper, and squeezed between the urban centers of Charleston and North Charleston. It’s not just a neglected part of our local history—it’s also a big part of our community’s future. Ask anyone around Charleston County to define “the Neck,” and you’re likely to get a variety of answers. For some folks, “the Neck” means the skinniest part of the peninsula between the Ashley and Cooper Rivers, around, say, Rosemont neighborhood, or Union Heights. Some might think of Magnolia Cemetery, and the other large burial grounds in that neighborhood. Hipsters might note the presence of several new businesses, including craft breweries, tattoo parlors, and a skateboard park (SK8). Most of us probably know “the Neck” as a landscape of abandoned industrial sites, littered with the contaminated vestiges of by-gone phosphate processing. A 1960s concrete highway carries thousands of cars every day over the neck, high above a landscape that’s been charred and scarred. In fact, the Neck is the sum of all of these parts, and much more, but its story is rarely included in mainstream conversations about the history of our community. History books generally describe Charleston Neck as a sort of a vacuum—a disorderly, unincorporated no man’s land lurking ominously beyond the northern boundary of the more genteel City of Charleston. In reality, however, the Neck did have a government of sorts during the nineteenth-century—an elected board of commissioners—and I’ve been collecting information related to their earnest efforts to enforce law and order. Before we delve into that political quagmire, we need to begin with a solid understanding of the geography of the Neck and the evolving definition of its physical boundaries. We’ll save the details of its government and its reputation for future programs. Charleston Neck, in geographical terms, is simply a peninsula—a long, narrow tongue of land surrounded on three sides by water. There are many “necks” in our nation, including, for example, Great Neck, New York; Bristol Neck, Rhode Island; and Scotland Neck, North Carolina. Closer to home, here in South Carolina we also have Graham’s Neck in Jasper County; Britton’s Neck in Marion County; and of course Wando Neck in what is now part of suburban Mount Pleasant. Charleston Neck isn’t a unique geographical phenomenon, of course, but there seems to be little consensus about the precise definition of its boundaries. That seemed odd to me, so I did some digging into the historical record. Here’s what I found: Over the past 350 years (nearly), there have been five different definitions of “the Neck” in the lexicon of metro Charleston. The geographic identity of the neck evolved in step with the growth of the local population and with the rise of commercial development. Let’s look at the evidence of each definition, starting from the earliest days of the Carolina colony. These facts about the initial settlement of colonial Charles Town underscore the relationship between the Neck and what is now the City of Charleston. Today we tend think of Charleston and Charleston Neck as distinct entities, one urban and the other suburban and even rural, but historically the city and the Neck have always been interdependent and connected, inhabiting the same geographic space since the 1670s. In the earliest days of the Carolina colony, the definition of “the Neck” encompassed all of the peninsula or tongue of land between the Ashley and Cooper Rivers, from the southernmost tip of White Point to a point several miles to the northwest. More specifically, the original northern boundary of the Neck was synonymous with the northern boundary of the parish of St. Philip. That seems like a simple enough definition, but where exactly is the northern boundary of the parish of St. Philip? The parishes of early South Carolina were officially created in 1706 as geographic precincts administered by the Church of England, but they also functioned as electoral districts until the new state constitution of 1868 swept aside the parishes in favor of a county electoral system. 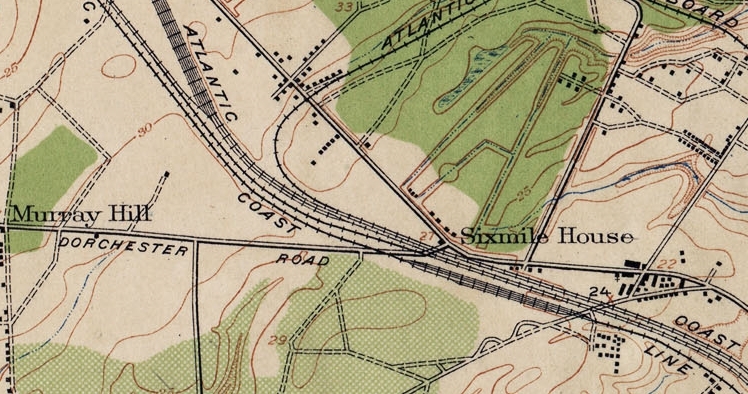 Prior to its dissolution, the northern line of the parish of St. Philip converged with the southwestern corner of the parish of St. James, Goose Creek, and the easternmost corner of the parish of St. Andrew, at a point that is today somewhere within the heart of the modern city of North Charleston. But where? The northern boundary of the parish of St. Philip was first defined in October 1698, before the parish even had a name. At that time, the provincial legislature ordered that the “first minister” of the first Anglican church in Charleston would be supported by taxes imposed on the people residing in “Charles’s-Town [sic], and the Neck between Cooper and Ashley-River, as far up as John [Bird’s] Plantation on Coopers-River [sic], and Chr[istopher] Smith’s Plantation on Ashley-River inclusive.” Those two plantations were also mentioned as the landmarks of St. Philip when the parish was first officially named in the South Carolina legislature’s “Church Act” of 1704, which the Lords Proprietors of Carolina disallowed in 1705. In the revised “Church Act” of 1706, the provincial legislature again named John Bird’s plantation on the Cooper River and Christopher Smith’s plantation on the Ashley River as the northernmost landmarks within the parish of St. Philip. So, where were these plantations located? A century ago, Henry Augustus Middleton Smith, the most prolific and meticulous property researcher of early twentieth-century Charleston, published a detailed study of dozens of old plantations on the Neck. Smith traced the chain of title for the tracts belonging to both Christopher Smith and John Bird, but he didn’t take the time to determine or describe their precise locations. I don’t have the time to dive down that rabbit hole either, so I turned to other records in search of useful details. I found that by the turn of the nineteenth century, the precise location of the boundary line wasn’t clear to anyone who lived in that rural, wooded area. In December 1811, the South Carolina legislature appointed a group of men to “ascertain and establish the boundary line of St. Philip’s Parish.” After four years of collecting documents, constructing chains of title for various plantations on the Neck, and re-surveying the area, the commissioners appointed in 1811 created a new plat showing the true course of the boundary line and presented it to the legislature in late November 1815. That plat doesn’t seem to survive, so we’re forced to look elsewhere for answers. According to a tax assessor’s notice published in the spring of 1815, the parish of St. Philip extended northward up to and including a wayside tavern known as “the Six-Mile House.” At that time, the Six Mile House was run by the notorious couple, John and Lavinia Fisher, who were hanged in 1820 for robbing a number of their houseguests. A few years later, in 1825, Robert Mills published his Atlas of South Carolina, which included a detailed map of the parishes contained within Charleston District. On that map, just north of the Six-Mile House and a major fork in the road, you’ll see the parish boundary indicated by a dashed line drawn across the neck. So where is that fork, and what are the names of those roads? For the first century of Charleston’s existence, there was just one road leading from urban Charles Town northward into the countryside. Traditionally called the Broad Path, the broad road, the high road, or the high way, this main road was really the northward extension of King Street, which led north out of Charles Town and traced a meandering route as it followed the path of high land along the length of the flat, marshy Neck. At the northern limit of the parish of St. Philip, where it met the southwestern point of the parish of St. James, Goose Creek, and the easternmost point of the parish of St. Andrew, the Broad Path forked. To the left, the road continued westward into St. Andrew’s Parish, towards the town of Dorchester. The other fork was really just the continuation of the Broad Path, leading in a northwesterly direction towards Goose Creek. That ancient intersection, marking the northern edge of the parish of St. Philip, also marks the end of the Neck. Where is that today? Believe it or not, it’s hiding in plain sight among the suburban sprawl of North Charleston, at the intersection of Dorchester Road and Meeting Street Road (formerly the Broad Path until it was renamed in 1786). So, the modern North Charleston neighborhoods of Cherokee and Charleston Heights, the Cooper River Memorial Library, and the southeastern part of the old U.S. Navy base are all located just within the parish of St. Philip, while the neighborhoods of Whipper Barony and Park Circle, and the northwestern part of the old Navy base, are just within the parish of St. James, Goose Creek. Moments ago, I mentioned a tavern called the Six-Mile House that once stood near the fork in the road at the northern edge of the Neck. At that site, there was also once a six-mile stone, one of many landmark stones erected in colonial times at specific intervals along the Broad Path leading to and from Charleston. There was once a four mile stone, a five mile stone, and so on, continuing in sequence into the countryside. Just this week, the kind folks at Richard Marks Restorations, Inc., shared with me a photo of the Four Mile Stone, which they’re preparing for display at the South Carolina Historical Society’s new museum, inside the old Fireproof Building at 100 Meeting Street. 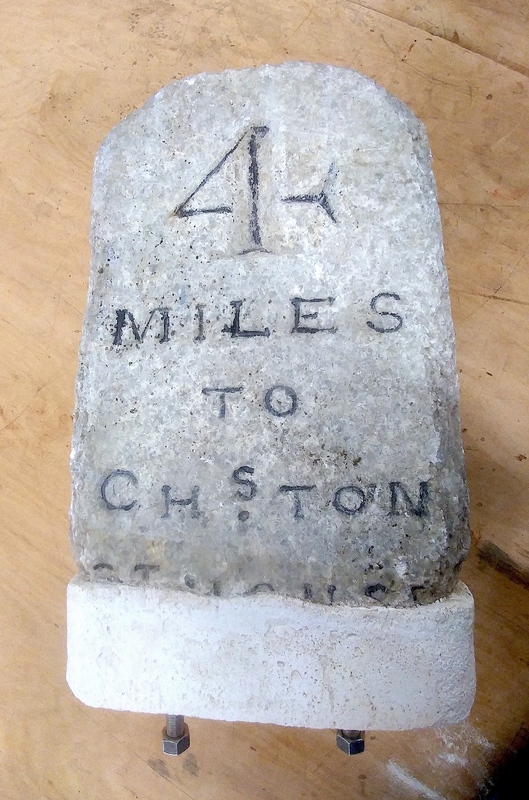 This stone, which probably dates from the late eighteenth-century, once stood along the side of the Broad Path on the Neck, informing travelers that it was “4 Miles to Ch[arle]ston C[our]T House.” Today, all that you find at that site is a short stub of a street on the Neck called Four Mile Lane. The so-called “Grand Modell” of colonial Charles Town, which established a grid of streets and lots in the 1670s, also created the first boundary line between the town and the rest of “the Neck.” From the late 1670s to the late 1760s, that boundary was an imaginary line running along a roughly east-west axis from the Ashley to the Cooper River. That imaginary line now runs along the south side of Beaufain Street (which was created by the subdivision of Harleston in 1770) and continued eastwardly a bit south of Hasell Street (which was created by the subdivision of Rhettsbury in the early 1770s). I’m calling it an “imaginary line” because urban Charles Town remained quite small for many decades, and its northern boundary existed more as a concept on paper than as a tangible reality. In December 1720, for example, Governor James Moore observed that “the Town line” was “now with great difficulty found out,” and would soon “be again lost, without effectual care be taken to establish and ascertain the same.” Although Gov. Moore recommended the legislature appoint surveyors “to settle and mark” the town line, and “to declare it a felony, to remove the said line after it has been surveyed, and found to be the true line,” the South Carolina legislature deferred the topic for more than a decade and let the confusion fester. In the 1720s, the boundary between Charles Town and the Neck was technically what you and I would recognize as Beaufain and Hasell Streets, but, in reality, there were hardly any houses north of Queen Street. After South Carolina became a Royal colony in 1730, however, the inhabitants of Charles Town experienced an unprecedented degree of stability and prosperity that triggered a period of rapid growth. By 1736, the town had definitely expanded and the streetscapes were definitely becoming denser. Around that time, the surveyor general finally marked the town boundary with a stone, and advertisements in the newspapers of Charles Town began making a clearer distinction between the new urban street called King Street and the rural Broad Path or high way on the Neck. Bishop Roberts’s 1739 map, titled “The Ichnography of Charles Town at High Water,” provides the first clear depiction of the line separating the town from the Neck, and it’s even labeled as the “Charles-Town Line.” In the map, the solitary road leading from the country side to town is called “the High Way,” but south of the town line that same thoroughfare is identified as King Street.” On the right edge of the map, representing the Neck outside of the town, you can also see Col. William Rhett’s plantation, known as Rhettsbury or Rhett’s Point, and George Anson’s plantation called the Bowling Green, both on the east side of the “High Way.” Today we know of these plantations as the neighborhood of Ansonborough, which most folks identify as being right in the heart of urban Charleston. In fact, it was the transformation of George Anson’s plantation in the middle of the eighteenth century that led to the next redefinition of the Neck. 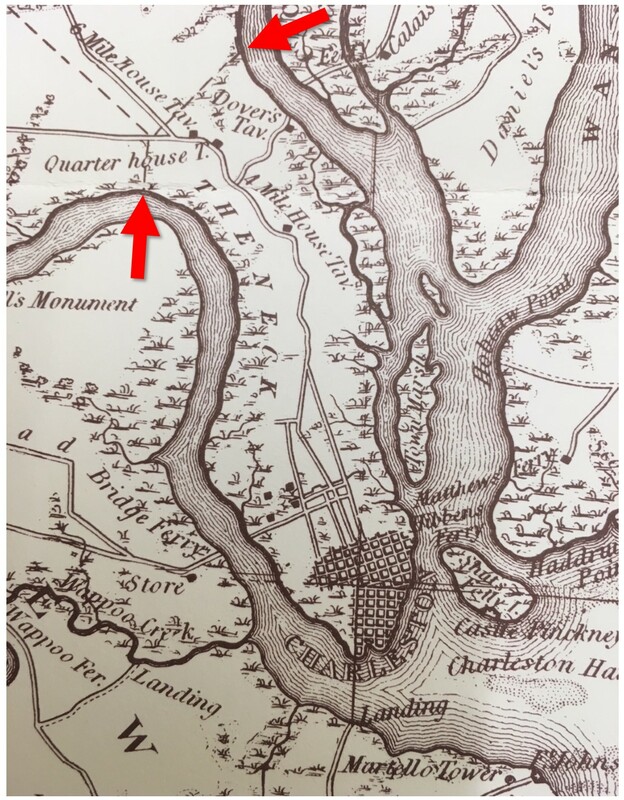 The next big change in the identity of Charleston Neck occurred several years before the American Revolution, as a result of the first wave of suburban development on the peninsula. To grasp the chain of evidence for this story, we have to back up August 1721, when the South Carolina General Assembly ratified a highway act that created a board of “Commissioners of High Roads” in each parish in the colony. In the parish of St. Philip, the only “high road” was the northward extension of King Street, the Broad Path that led from the town, up the Neck, and into the other parishes. The Commissioners of the High Roads for the parish of St. Philip had very little jurisdiction over the streets of urban Charles Town, which experienced a significant construction boom in the 1730s and 1740s. As the town grew denser, developers for the first time began to look northward—beyond the town line—for new real estate. The residential subdivision of George Anson’s pasture land, called Ansonborough, began in 1745 with a grid of new streets and dozens of new suburban lots for sale on the east side of the Broad Path. As the town grew denser and the population increased in the 1740s, residents began clamoring for better public services in unincorporated Charles Town. The streets had become crowded and filthy, filled with animals, wheel ruts, and potholes. Something had to be done, but there was no form of town government to answer the call. In May 1750, the South Carolina General Assembly ratified an act that created a new board of commissioners to superintend the streets of urban Charles Town. In a roundabout way, this act paved the way for the physical expansion of the unincorporated town’s civic boundary, and simultaneously laid the groundwork for the future incorporation of Charleston. It’s a fascinating document that has never been published, but we’ll save the details for a latter program. Meanwhile, back to the Neck story. The act of 1750 empowered the new street commissioners to raise a new and additional tax—essentially a “town tax”—on all urban properties in Charles Town that abutted a public street, for the purpose of creating and maintaining the urban streets. As old streets were extended and new streets created after 1750, the owners of properties abutting the new streets became liable to pay the additional “town tax.” As a result of this process, the physical boundaries of urban Charles Town expanded, to the north and to the west, in a series of dramatic episodes. In 1767, the residents of the suburb of Ansonborough successfully petitioned the provincial legislature to extend Meeting Street northward, from Cumberland Street (created in 1747) to George Street (created in 1745). 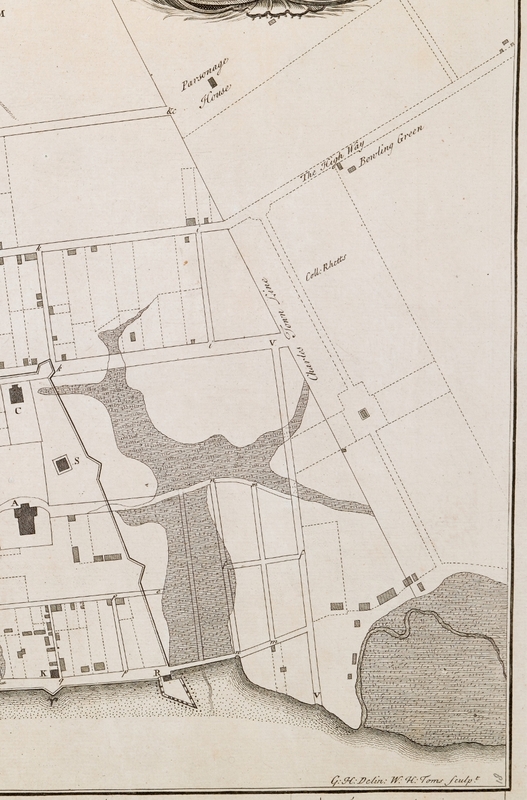 Two years later, in 1769, those same suburban residents petitioned the legislature to create a new cross street on the northern edge of Ansonborough, stretching from the Broad Path eastward to the Cooper River. The creation of this new street, called Boundary Street at the time, represented the first unofficial but very practical step of annexing part of the Neck into the town. In the autumn of 1769, however, Boundary Street only existed to the east of the Broad Path, or King Street. That anomaly changed in the spring of 1770, when the South Carolina legislature ratified an act to lay out and adopt several new streets to the northwest of Charles Town, in a new neighborhood called Coming’s Point or Harleston. 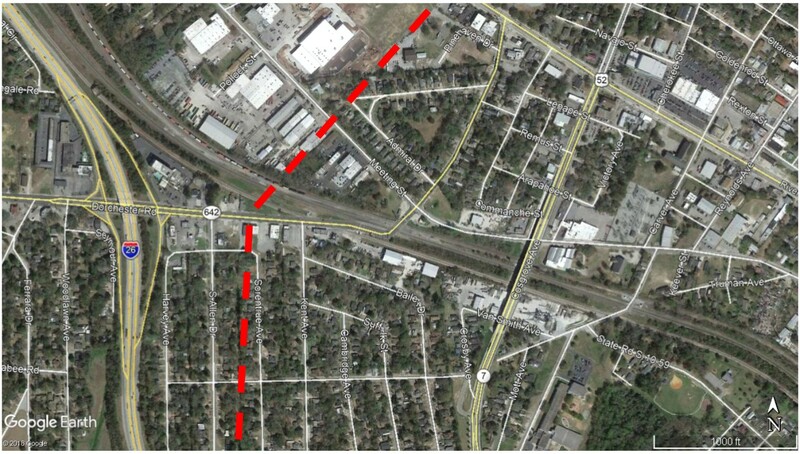 The northernmost line of that new suburb was a path called Manigault Street, which stretched from the intersection of Boundary Street and the Broad Path westward to the Ashley River. At some unknown point during the American Revolution, the name “Manigault Street” disappeared, and the entire path across the Neck, between the Ashley and Cooper Rivers, became known as Boundary Street. As its name implies, the creation of Boundary Street (now called Calhoun Street) was a redefinition of the division between the town and the Neck. For all practical purposes, the legislative acts of 1769 and 1770 represent the annexation of the southernmost part of the Neck into the higher tax bracket of urban Charles Town. The town remained an unincorporated entity until 1783, however, so there was no municipal charter to amend and no increase of corporate responsibilities. Only the Commissioners of Streets, created in 1750, noticed an expansion of their responsibilities and their tax base. In short, the perceived geographic scope of the Neck definitely shrank during the wave of prosperity and expansion in the years just before the American Revolution, but the legal definition of the Neck did not officially change until after the war. The statute confirming the incorporation of the City of Charleston, ratified by the South Carolina General Assembly in August 1783, formally and legally recognized Boundary Street as the city’s northern limit. From that moment onward, the advent of municipal government in Charleston gradually sharpened the economic and cultural distinctions between the city and the Neck. In the ensuing decades, the relationship between the urban, highly-regulated, dense population of the city and the highly-unregulated, sparse population of the Neck began to deteriorate. Born as siblings sharing a narrow tongue of land, the city and the Neck developed a kind of unhealthy, cantankerous rivalry in the early nineteenth century that lasted well into the late twentieth century. That’s the subject of next week’s episode, when we’ll pick up the story in the late 1780s and stretch the geographic definition of the Neck up to the present day. William Owen to Lord Ashley, 15 September 1670; Joseph Dalton to the Lords Proprietors, 21 March 1670/1; in Landon Cheves, ed., “The Shaftesbury Papers and Other Records Relating to Carolina and the First Settlement on Ashley River Prior to the Year 1676,” in Collections of the South Carolina Historical Society, volume 5 (Richmond, Va.: South Carolina Historical Society, 1897), 197; 284. For more information about the “Grand Modell” of Charleston, see Susan Baldwin Bates and Harriott Cheves Leland, eds., Proprietary Records of South Carolina, Volume Three: Abstracts of the Records of the Surveyor General of the Province, Charles Towne, 1678–1698 (Charleston, S.C.: History Press, 2007), 21–22, 33–36. Samuel G. Stoney, ed,. “A Contemporary view of Carolina in 1680,” South Carolina Historical Magazine 55 (July 1954): 153–59. See Act No. 225, “An Act for the establishment of Religious Worship in this Province according to the Church of England, and for the erecting of Churches for the public Worship of God, and also for the maintenance of Ministers, and the building convenient Houses for them,” ratified on 4 November 1704, in Statutes at Large, 2: 236–46; Act No. 256, “An Act for the Establishment of Religious Worship in this Province, according to the Church of England, and for the erecting of Churches for the Public Worship of God, and also for the Maintenance of Ministers and the building [of] convenient Houses for them,” ratified on 30 November 1706, in Statutes at Large, 2: 282–94. Henry A. M. Smith, “Charleston and Charleston Neck: The Original Grantees and the Settlements along the Ashley and Cooper Rivers,” South Carolina Historical and Genealogical Magazine, 19 (January 1918), 41–43 (of 3–76). Smith discusses John Bird’s property on pp. 37–39, 55, and Christopher Smith’s property on pp. 41–43. Act No. 1991, “An Act to appoint certain commissioners to establish the parish lines between St. Philip’s and St. Andrew’s; between St. Andrew’s and St. James, Goose-Creek, and between St. Andrew’s and St. George’s, Dorchester; between St. Philip and St. James, Goose-Creek; and between St. James, Goose-Creek, and St. George, Dorchester,” ratified on 20 December 1811, in Thomas Cooper, ed., The Statutes at Large of South Carolina, volume 5 (Columbia, A. S. Johnson, 1839), 645. See South Carolina Department of Archives and History (hereafter SCDAH), Committee Reports to the General Assembly, 1813, No. 45 (from November 1813); SCDAH, Miscellaneous Communications to the General Assembly, 1815, No. 7 (dated 29 November 1815). See Charleston City Gazette, 11 April 1815. SCDAH, Journal of the South Carolina Commons House of Assembly, 1716–21 (Green’s transcription), 16 December 1720, page 481. For the presence of the stone in the town line and related surveys, SCDAH, Secretary of State, Surveyor General’s Office, Surveyor’s Notebook for Charles Town, 1732-1752, folio 41, verso (page 78). Act No. 442: “An Act to empower the several Commissioners of the High Roads, private paths, bridges, Creeks, causeys [sic], and cleansing of water-passages, in this Province of South Carolina, to alter and lay out the same, for the more direct and better conveniency [sic] of the inhabitants thereof,” ratified on 15 September 1721, in David J. McCord, ed., Statutes at Large of South Carolina, volume 9 (Columbia, S.C.: A. S. Johnston, 1841), 49–57. Act No. 775, “An Act for keeping the Streets in Charles Town clean, and establishing such other regulations for the security Health and Convenience of the Inhabitants of the said Town as are therein mentioned, and for establishing a new Market in the said Town,” ratified on 31 May 1750. This act was not included in the nineteenth-century collection of the Statutes at Large of South Carolina, but the engrossed copy of the law is found among the manuscript records of the General Assembly at SCDAH. The provincial legislature refined and extended the responsibilities of the Commissioners of Streets in a series of statutes ratified between 1751 and 1775. Act No. 954, “An Act for impowering the Commissioners of the Streets in Charlestown, to lay out and continue old Church-street [Meeting Street] to George-street, in Ansonborough; and for building a Bridge and Causey at the North end of the Bay of Charlestown,” ratified on 18 April 1767, in David J. McCord, ed., The Statutes at Large of South Carolina, volume 7 (Columbia, S.C.: A. S. Johnston, 1840), 85­–87. Act No. 985, “An Act for laying out and establishing a public Street in Ansonburgh [sic], and the parts adjacent thereto,” ratified on 23 August 1769, in Statutes at Large, 7: 92–93. Act No. 991, “An Act for laying out and establishing several new Streets in the North-west parts of Charlestown; and for building a new Parsonage House for the Parish of Saint Philip, Charlestown; and for empowering the Vestry and Church-Wardens of the said Parish, for the time being, to lay out part of the Glebe Land of the said Parish, in Lots, and to let the same out on Building leases; and for other purposes therein mentioned,” ratified on 7 April 1770, in Statutes at Large, 7: 93–96. Act No. 1191, “An Act to Incorporate Charleston,” ratified on 13 August 1783, in Statutes at Large, 7: 97–101.